so you can be honest with me - have you tired of my soup posts? i sure hope not! this time of year Justin and i literally enjoy soup at least 2-3 times a week. 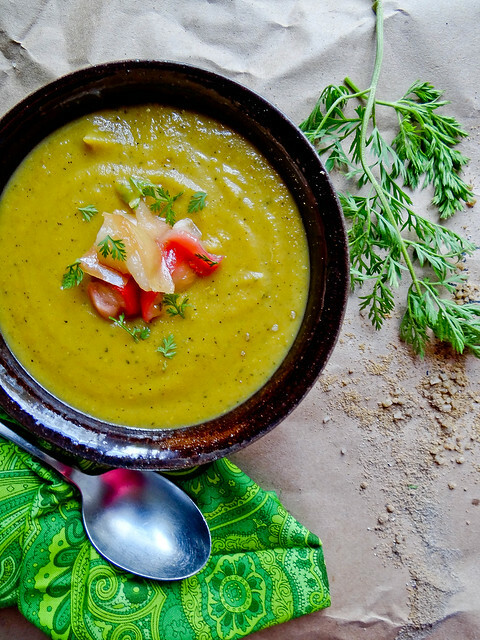 soup is warm, satisfying, makes for great leftovers and tastes even better the next day. 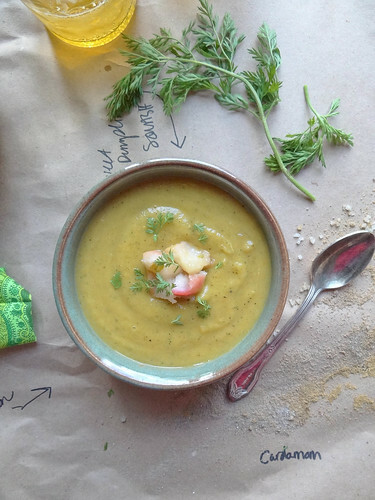 for pennies on the dollar, soup has a lot of goodness to offer. plus, it's pretty hard to screw up soup or if you want to get all fancy and call it bisque like i do you can! soup with its fancy pants on = bisque (but really the truth is its just a creamy soup)...wow i am pretty sure this creamy soup is having an identity crisis since it doesn't have cream in it either. so simple is good right? 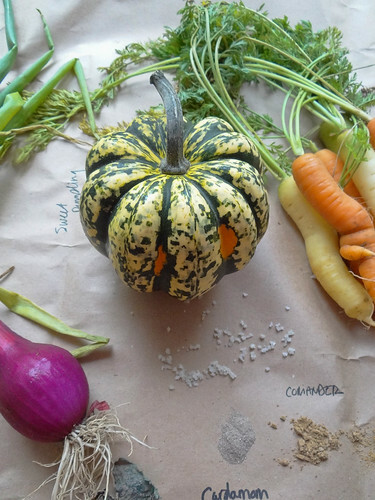 onion, sweet dumpling squash & carrots are roasted until tender and caramelized. the roasted veggies are transferred to a soup pot where warm toasted spices such as cardamom, coriander and cumin are added along with a bay leaf and plain old water. the soup is left to simmer for 20-30 minutes, then pureed silky smooth. 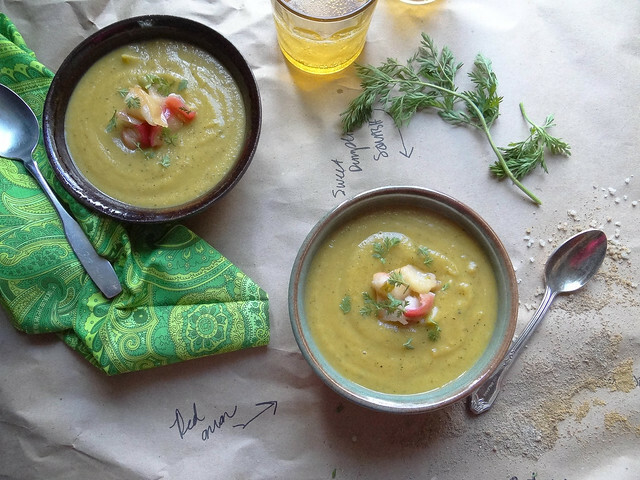 salt, sauteed apples & carrot fronds are a beautiful garnish - we also enjoyed pepitas sprinkled over the soup too. i love adding a bit of texture to soups by way of a fun garnish. if you have time, crispy carrot rounds with a sprinkle of carrot fronds or parsley would be beautiful too. 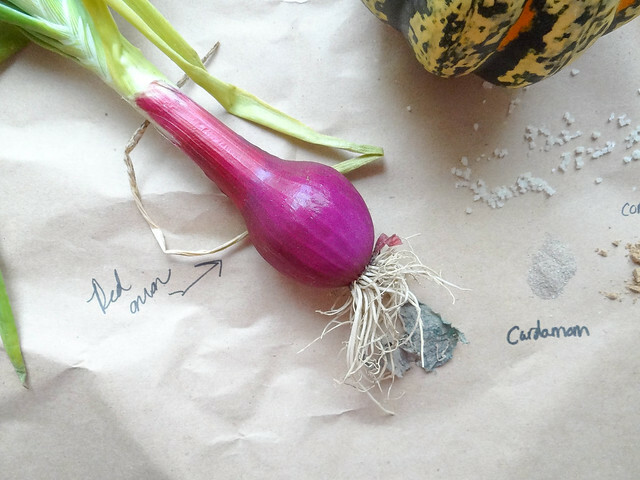 simple, inexpensive, humble ingredients are turned into a beautiful and healthy soup with minimal effort. 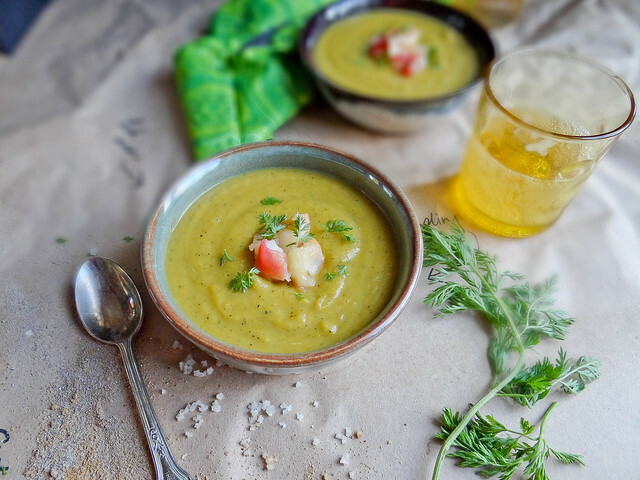 why don't you take just a few moments out of your day and create this nourishing soup for those you love. can i tell you how in love i am with the black specks dotted throughout the golden soup - the second best thing about sweet dumpling squash aside from its taste is the fact their skin is edible, it is what creates the speckled effect throughout the soup. if you have time, i strongly suggested making this one day and waiting to serve it the following day. when allowed to rest overnight the flavors of the bisque intensify and become even more wonderful. what is the meal during the week you find yourself going back to throughout the winter? 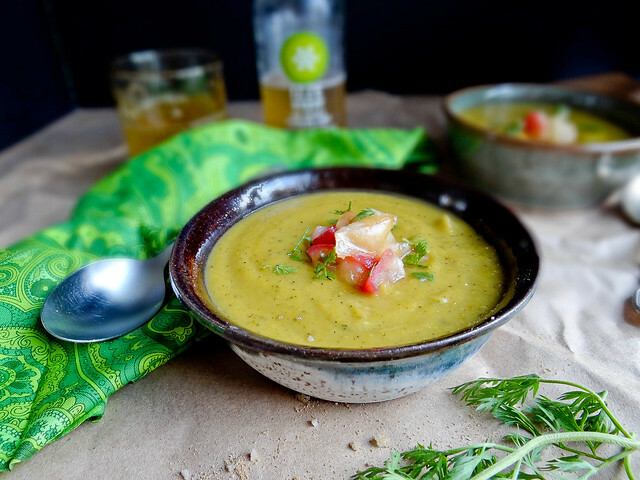 do you crave soup this time of year as much as i do? on a rimmed baking sheet spread prepared carrots, sweet dumpling squash & onion- toss with 2 tsp canola oil. roast in pre heated oven for 20-30 minutes checking and tossing veggies at the half way point until roasted golden. in a soup pot over medium heat toast spices until fragrant (coriander through cardamom). add roasted veggies, salt, bay leaf and 6-8 cups water (water depends on how thick you like your bisque). bring to a boil, reduce heat & cover- simmer on low for 20 minutes. 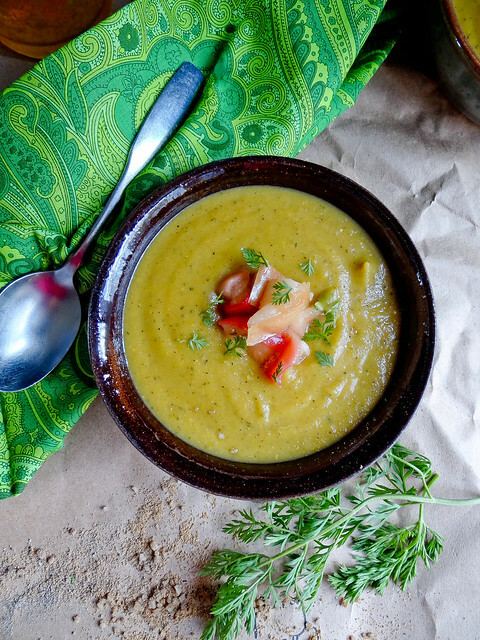 remove from heat, with an immersion blender blend soup until smooth and creamy. ladle into bowls and garnish eat bowl with the topping of your choice. Yum! I use to really think I hated all carrot based things that weren't just me nibbling on carrots, but I have recently realized this is no longer true. I will have to add this to my list of dinner options. i'm not tired of them! i've been craving soup lately and need to definitely make some over the weekend. this looks perfect! I will never get tired of soup posts! :) I love this combination of simple roasted veg. keep them coming.. all these gorgeous bowls of soup. the bowls are so pretty too! did you get a new lens? I could never get tired of your soup posts! 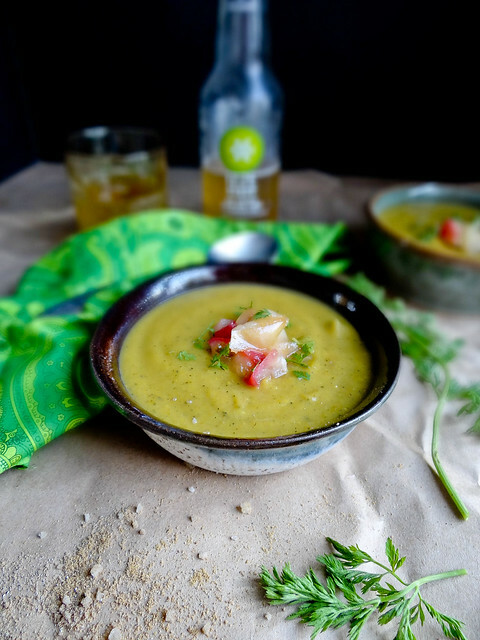 I could eat soup every day, even in summer! This one is lovely, I'm always so jealous of your beautiful produce. 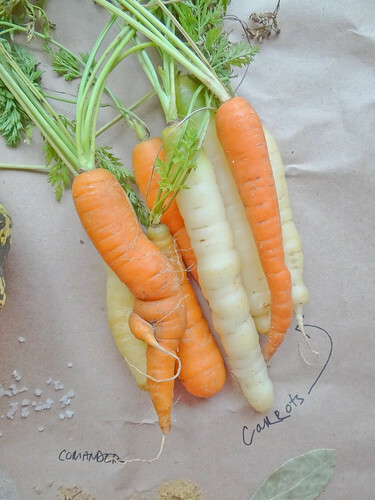 Those carrots make my giant organic bag from costco look really, really sad! 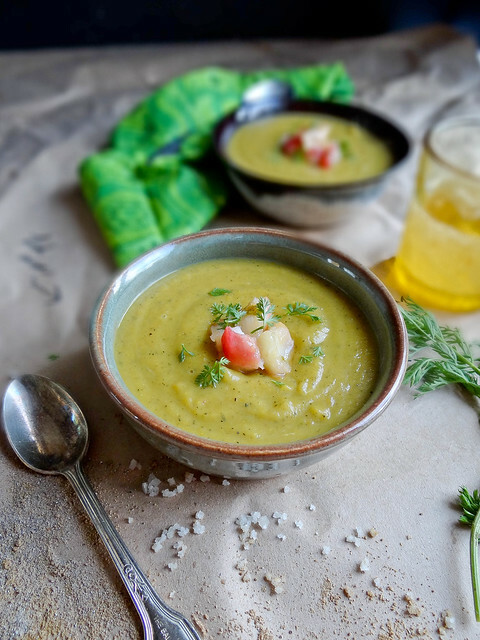 I never get sick of soup - especially the creamy kind made with root veggies! I like your choice of spices in this one - I don't usually think to add coriander or cardamom but I bet they add such a nice flavour! Ohh it's eye candy out of soup! I love how this soup looks both rustic and sophisticated at the same time. Beautiful! Yum! 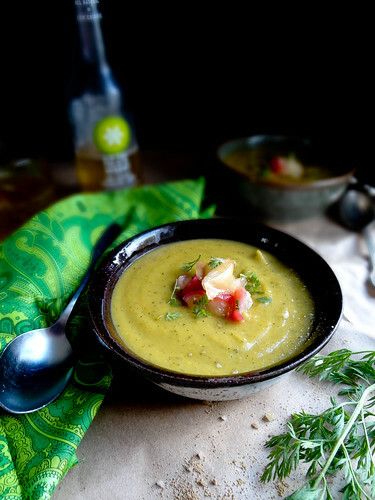 Sauteed apples as garnish for this tasty looking soup. I imagine the combination of those flavours would be quite divine! I love your soup posts- I can't get enough soup this time of year! This one is gorgeous and like the little specks throughout as well. Those bowls are really great too- where'd you get them? I am in love with your pictures. This recipe looks awesome too! Don't think I've ever had dumpling squash, intriguing! You make beautiful soups! Why can't we be neighbours or something, so I can try your creations! LOL! 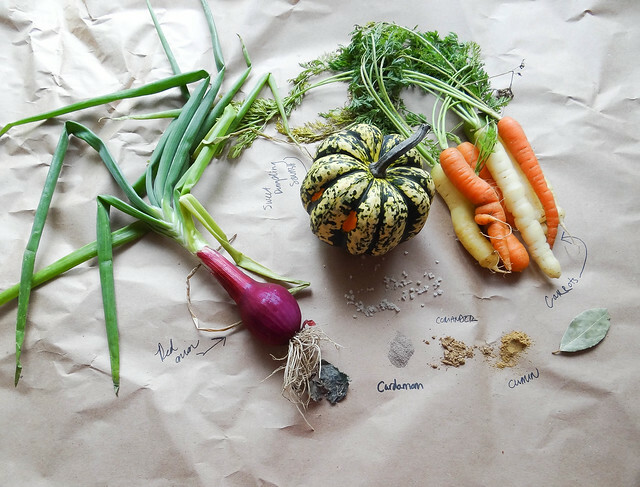 Your garden produce are equally beautiful! I'm leaving here tonight wanting something hot and heart-warming! roasted beet + carrot salad // tempeh "croutons"
a smbp thanksgiving round up!